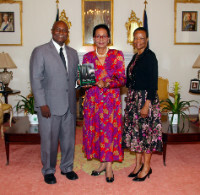 Mrs. Eva Joyce presented Governor General, Her Excellency the Most Hon. 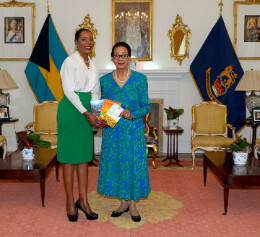 Dame Marguerite Pindling with copies of her books, "Rekindling the Fire within," "Hidden Treasures," and "The Journey Home" during a courtesy call at Government House on Tuesday, February 26, 2019. 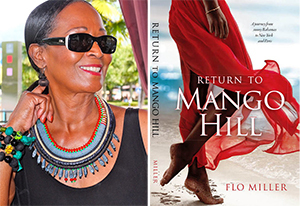 Return to Mango Hill is about the life of Sammie, a young girl growing up on Mango Hill with her family and siblings. 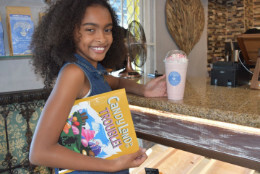 A bright eyed, inquisitive child with big dreams, Sammie’s life would take her from the powder white beaches of The Bahamas to the hustle and bustle of New York to the land of love and art, France to the fashion mecca, Italy. 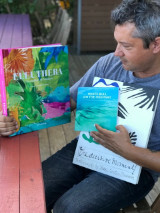 Those in love with Eleuthera and all of its charms will have an opportunity to meet and talk with Italian photographer Alessandro Sarno who captured the idyllic beauty of the island in his newly released photo book, Eleuthera: The Garden of Freedom and its complimenting travel guide, White Bull on the Highway. 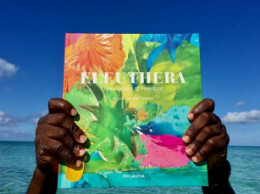 If a picture is worth a thousand words Italian photographer Alessandro Sarno said a mouth full in his coffee table, photo book, Eleuthera: The Garden of Freedom and its complimenting travel guide, White Bull on the Highway – a beautiful way for armchair travelers to explore the idyllic island and for locals to rediscover favored hideaways. The official book launch and signing for Sarno’s latest photographic work, the second in his island series, is set for Wednesday at the National Art Gallery of The Bahamas at 6:30 pm. Plastered in Pretty by N.C. Marks is a new pop culture novel published here by House of Nehesi Publishers (HNP). Marks, from St. Vincent and the Grenadines, has written a “ferocious depiction” of a world dominated by social media appearances, said Gerty Dambury, a Prix Carbet author based in France. Felicity L. Johnson, Author. Launch date: Sunday, December 2nd 2018 from 2-4pm at Doongalik Studios, #20 Village Road. The Black Prince of Grant’s Town is a biography / memoir of Johnson’s father, Basil L. I. Johnson, C.B.E., D.F.M (1920 – 2004). Basil Johnsons’ life is a walk through our nation’s history spanning 80 plus years of significant change. 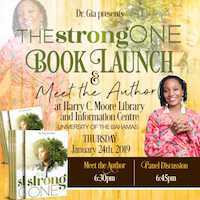 The book provides invaluable insight into important events such as unionism and the 1958 General Strike, the Bahamas’ involvement in World War II, The Electricity Department and the treatment of World War II veterans by the Government of the Day. Rev. 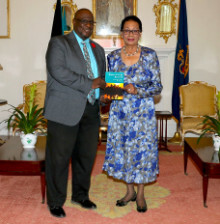 Dr. Philip Rahming presented a copy of his recent book, 'The Unsigned, Undelivered Letter,' in a courtesy call on Governor General, Her Excellency the Most Hon. Dame Marguerite Pindling at Government House on Tuesday, October 23, 2018. 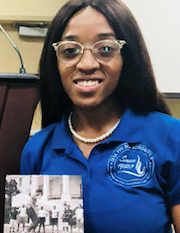 A former student of the Grand Bahama Catholic High School, Freeport, Grand Bahama, and now a senior at Florida Memorial University, Charleigha Knowles is certainly making her mark as her writings have been included in the book, "Michelle Obama’s Impact on African American Women and Girls." 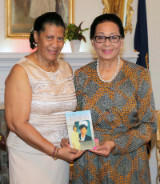 Governor General Her Excellency Dame Marguerite Pindling was presented a book entitled, “The Journey” by Mrs. Emily Osadebay on June 4, 2018, in the Drawing Room of Government House. 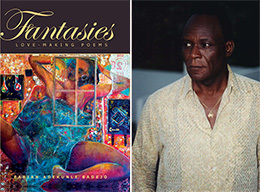 Fantasies – Love-making poems by Fabian Adekunle Badejo has just been published here by House of Nehesi Publishers (HNP), said the indie press president Jacqueline Sample. 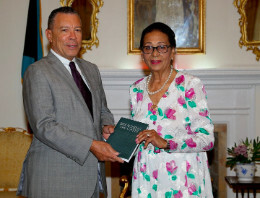 Sean McWeeney presented a copy of his book "Breaching the Gates" to Governor General Her Excellency Dame Marguerite Pindling during a courtesy call at Government House on Monday, April 16, 2018. 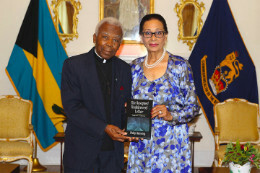 Veteran Journalist and Photographer Eric Rose presented a copy of his book, Poetry of A Life Renewed, to Her Excellency Dame Marguerite Pindling, Governor General, during a courtesy call at Government House, Tuesday, October 31, 2017. Dr. Leon Higgs presented a copy of his book, Barefoot to the Boardroom, to Governor General Her Excellency Dame Marguerite Pindling (centre) in a courtesy call at Government House on Wednesday, October 25, 2017, accompanied by Mrs. Higgs (right). 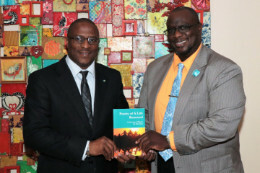 Veteran journalist and award-winning poet and photographer Eric Rose presented a copy of his book, Poetry of A Life Renewed to the Minister of Youth, Sports and Culture the Hon. Michael Pintard during a courtesy call at the Ministry on Monday. The more Leila O’Brien reads, the more she writes, blossoming and flourishing like the beautiful flower she is, inside and out. With loose leaf paper on her desk and pen in hand, the third grader’s vivid and creative imagination bursts forth colourfully, naturally and quickly. 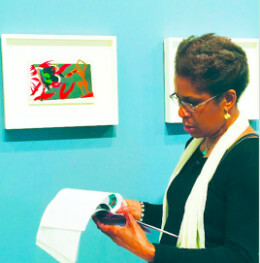 Art helps us to imagine, even create our possibilities. Literature, the word, gives us license to put pen to paper, to creatively express our thoughts. The wedding of both genres in books from House of Nehesi Publishers (HNP), was recently celebrated with an art exhibit in St. Martin at the intimate gallery of the elegant Sheer Restaurant. 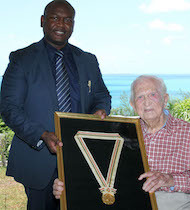 Sir Durward Knowles who is now the oldest living Olympic champion in the world and a renowned Bahamian sailor, is penning another book to be released in October 2017, a month before his centurion birthday. 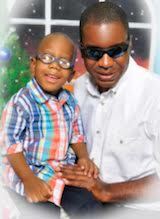 Sir Durward has chosen Scholar Books to publish “Never Give Up,” an inspirational book that covers his recovery from serious health complications that had caused him to rearrange his entire life.